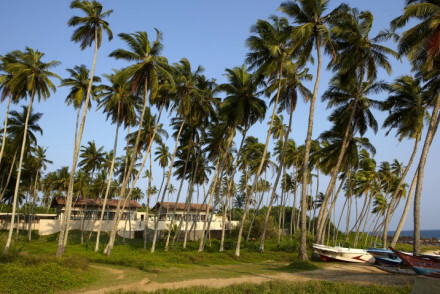 Tangalle's coastline, alternating between rocky promontories and long sweeps of pale yellow sand, is what draws many to this large town and the beautifully lush region surrounding it. The mild, sunny weather helps too, plus there's an important ancient rock temple nearby, and a Turtle Conservation Project and a Bird Sanctuary. So this is a great place to get a taste of many of Sri Lanka's pleasures without having to stray too far from the views, and other relaxing comforts, of your sun lounger. 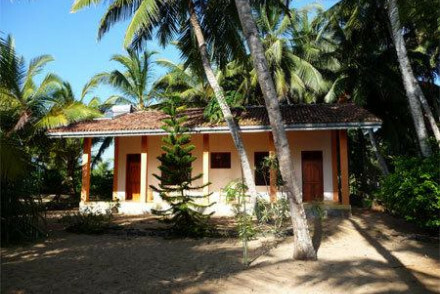 Our pick of the best places to stay in Tangalle are mainly coastal properties, but all are ideal bases for exploring further afield too. Head over to Mulgirigala Raja Maha Vihara, an ancient Buddhist temple (over 2,000 years old!) boasting fabulous views. Wander around with a volunteer and learn all about the place's rich history. Bundala National Park is a great place to go on safari! This wetland is full of crocodiles, lions, a huge variety of birds and monkeys. A top spot that the whole family will love. Kalamatiya Bird Sanctuary, featuring around 150 species of birds, is a fantastic place to go birdwatching. As the sanctuary is on a lagoon you'll need to take a canoe out, but there's also a good sandy beach to relax on with a picnic. Spend an afternoon wandering around Mirijjawila Botanic Gardens, the second largest botanical gardens in Sri Lanka and home to a huge variety of dry zone plants. Just remember that the best places to stay in Tangalle are very busy during peak periods, so unless you want to come off season, plan well ahead! For top end luxury right on the beach, one of the best places to stay in Tangalle is Amanwella. This resort is all about relaxation, the architecture is elegantly sparse - zen even, the terrace is fanned by palm trees and each of the thirty suites has its own plunge pool. But despite the focus on relaxation there's plenty to do here, from birdwatching to whale watching, fishing, snorkelling, and windsurfing. They even run cooking classes. Buckingham Place: the name comes from the owner's surname, rather than any suggestion of opulence! In fact these 12 guest lodges are modern and minimalist, with excellent views over the lagoon. Just out of a small fishing village and far from the crowds. Mangrove Beach Cabanas boasts unassuming private wooden cottages right on the beach. Get to know the other guests at the popular bar, or enjoy traditional Sri Lankan cuisine at the restaurant. A top value beach stay. The Last House is a stylish stay with antiques, exposed beams, colourful interiors and shabby chic accommodation. Join in with a yoga class, unwind with an Ayurvedic massage or head down to the beach and soak up the sun. Bkes available to use if you fancy exploring the area. 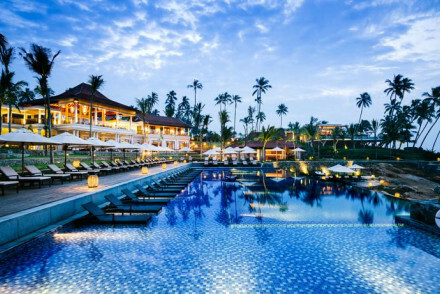 Antantara Tangalle is a modern wellness resort with private villas offering smart rooms. There are three restaurants to choose from, and you'll feel utterly rejuvenated with a visit to the extensive wellness centre specialising in Ayurvedic therapies. Located right on the beach! Maya Old House is a good option for people looking for somewhere remote and unique to stay. 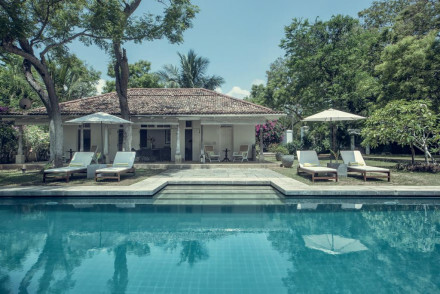 It's set in amongst the jungle and the paddy fields, on its own two acre estate and is one of the best places to stay in Tangalle (or even the whole of Sri Lanka) if you want to step back in time to the days of Ceylon. The colonial style building has wide verandahs set around a wonderful courtyard pool, and the guest rooms have 25ft ceilings. They're so charmingly traditional they offer cricket, tai chi and petanque. If you think you'd be best served by a self-catering option then check out the wide variety available at our online partner, booking.com. With an average annual temperature of 26.9 °C, Tangalle is warm year-round. Whilst there's not a huge temperature difference between the months, the least rainfall occurs in February, March, June and July - so this is probably the best time to visit. Tourists will need to fly into Bandaranaike International Airport (aka Colombo Airport). This is, however, still around 5 hours from Tangalle. You'll need to take a shuttle bus from the airport to the Colombo Fort area, before taking a train to Matara. From here you can either take a bus to Tangalle or a tuk-tuk if you fancy something a little different! Browse through our list of all the best places to stay in Tangalle. Alternatively, widen the net and check out all our recommendations in Sri Lanka. Simple yet chic this unassuming little cluster of wooden cottages has been welcoming guests for years. Ideal for travellers or couples on a budget, seeking some relaxation. There is a popular bar where guests congregate plus a beach restaurant serving tasty Sri Lankan dishes. Great value. 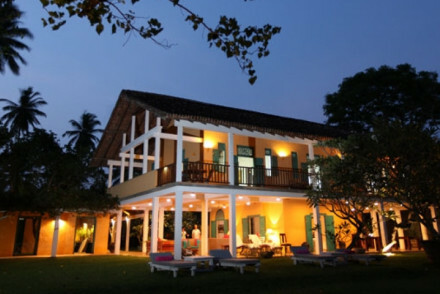 A stunning historic building, turned luxury adults only resort in the jungles and paddy fields near Tangalle. The three private villas offer a romantic and luxurious retreat, while the main house oozes colonial charm from its seating and dining areas littered with antiques and leather-bound books. A boutique villa tucked away on one of the quietest, yet prettiest, of Sri Lanka's southern beaches. Five individually styled rooms are simply designed with soft hues, four posters and large windows overlooking the tropical gardens. Fabulous service lends that perfect mix of homely luxury. Beach Life - Just steps from a gorgeous stretch of uncrowded beach. Sights nearby - Visit the Tissamaharama Raja Maha Vihara where the Buddha himself was said to have meditated. 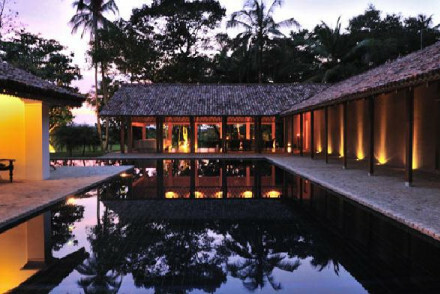 Sri Lankan architect, Geoffrey Bawa's final creation The Last House provides an iconic and stylish stay. Think colourful interiors, plenty of antiques, exposed beams and roll-top baths: a perfect mix of old and new. Meals are served al fresco and (bar breakfast) are arranged on request. Superb. Recently opened this modern wellness resort is ideal for individuals, families or couples seeking relaxation. Private villas allow for ultimate privacy, whilst a popular kids club means grown ups can leave the little ones behind. Dine on Italian dishes at Il Mare or fusion cuisine on the beach. Restored villa with a central courtyard in its own elegant estate filled with flora and fauna. A retreat for nature lovers, families, or romantics. 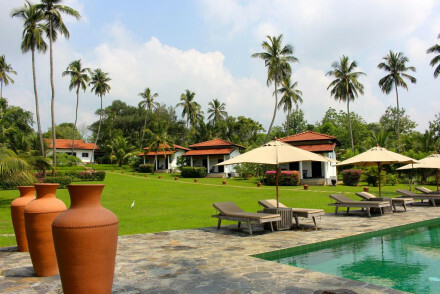 Contemporary rooms with colonial influences, beautiful verandahs, and surrounding paddy fields. Excellent home cooked food. A lovely relaxing retreat. Sights nearby - Visit the Buddhist Temple and Mulgirigala Rock Temple both just 15 minutes from the hotel. Cooking classes - Learn to cook Sri Lankan style with the hotel chef. A newly built and cleverly designed hotel, in spacious grounds brimming with exotic plants. Minimalist guest lodges with stunning views, excellent food and friendly service. 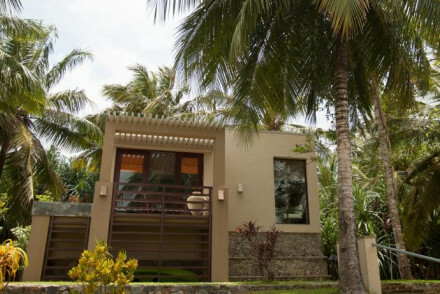 A tranquil escape yet close to the beach - a great spot for nature lovers and couples. Romantic Break - A place of tranquility and privacy with gorgeous airy rooms overlooking the surrounding nature. Back to Nature - An abundance of biodiversity with architecture designed to merge living and nature. Sights nearby - Visit the magnificent Mulkirigala Rock Temples in Tangalle. Sailing - Spot sperm whales and dolphins on a boat trip. Top end luxury and serene zen spaces on the edge of a coconut grove overlooking a wonderful beach. Sparing contemporary-chic design and fantastic facilities in this natural location. Sumptious cuisine enjoyed with a lovely sea view. A contemporary beach haven. Beach Life - Sitting on a beautiful private 800m crescent beach- enjoy turtle watching, 'fresh-off-the boat' seafood and golden sands. Back to Nature - Submerge yourself in the lush green environment and observe sea turtles, monkys, birds, lizards and mongooses. Cooking classes - Accompany the hotel's chefs to the early morning fish and spice market, and learn to cook your favourite curry. Sailing - Take a trip on a restored Indonesian fishing boats out to sea to try your luck at whale watching.